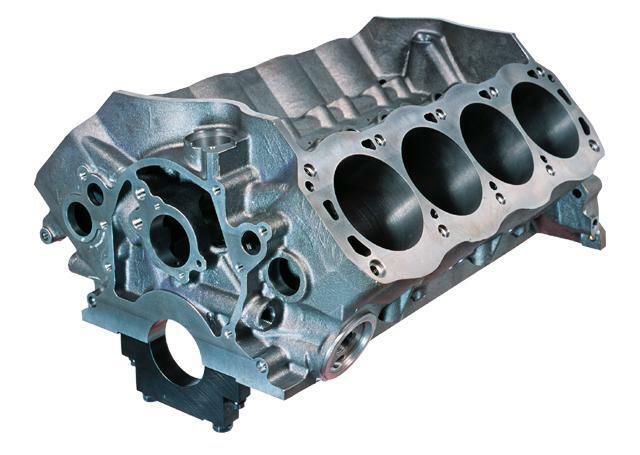 Dart Iron Eagle Block - Dezod Motorsports Inc - Home of the automotive performance enthusiast since 2002. Siamesed cylinders: Standard 4.000” or 4.125” cylinders can be safely bored to 4.165” diameter. Ductile iron sleeves and extra thick walls prevent cracking and produce excellent ring seal. Ductile iron front and rear 2 bolt main caps with 4 bolt interior main caps. Rear cap uses standard one piece seal. Two main bearing diameters 302 (2.249”) or 351C (2.749”) allow choice of small or large journal camshaft. Standard camshaft and camshaft drive can be used. Lifter valley has bosses for production hydraulic roller lifters.